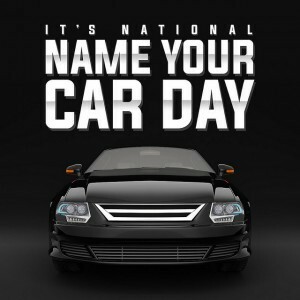 It’s National Name your Car Day! On October 2nd it’s time to make a commitment to your wheels. On National Name Your Car Day, give your trusty automobile what it really needs. Many of you most likely remember Herbie the Love Bug, Lightning McQueen from Cars, Kit from Knight Rider, General Lee from The Dukes of Hazzard and Bandit from Smokey and the Bandit. These are just some of the famous car names that are known by millions of people. Make a day of it. Take the ol’ jalopy out for a spin, a nice wash, and shine and then just maybe you will select a signature meant for one so reliable. After all, you spend all that time together and take such good care of each other, isn’t it time to give those four wheels a name? Pick out a name for your car if you haven’t already. Use #NameYourCarDay to post on social media. Show pictures of you jalopy with that new name on a sign placard for all to see.